Women hold their registration cards while waiting to cast their vote in Timor-Leste’s Parliamentary Elections. Photo by Louise Stoddard posted by @UNDP. On 9 July South Sudan celebrated its first anniversary as an independent country. Photo posted by @UNDP. Alexandra Eurdolian (@AlexandraKE), our colleague who works at @Refugees posted this photo from the staff entrance to the Palais des Nations outside UN offices in Geneva. As the humanitarian crisis in the Sahel continues, so does the work of UN agencies like the World Food Programme in West Africa (@WFP_WAfrica), who shared this photo from Mali of boats carrying food by river to Timbuktu. Dr. Mirta Roses Periago (@mirtaroses), Director of the Pan American Health Organization, tweeted this photo highlighting the importance of washing hands with soap and water, as one of the most cost-effective measures against the transmission of diseases. “Let us work together to build a world where everybody can live full of love, peace, happiness, prosperity and human rights,” was the wish Secretary-General made to commemorate Tanabata (Star Festival), a Japanese tradition in which people write their wishes for the future in a piece of paper and hanging them on bamboo. Photo posted by the UN Information Centre in Tokyo (@UNIC_Tokyo). Goodwill Ambassador Barbra Hendricks visited Mali refugees in Burkina Faso earlier this week. Photo by by Helene Caux (@helenecaux) posted by @Refugees. Football star Emerson Ferretti joined the UNAIDS “Give Aids the Red Card” campaign. He is pictured here with Djibril Diaollow (@DDiallo_UNAIDS) in Salvador de Bahia, Brazil. Angga Dwi Martha (@angga_dm) shared this photo from an event in Indonesia highlighting World Population Day and youth with UNFPA (@UNFPA). 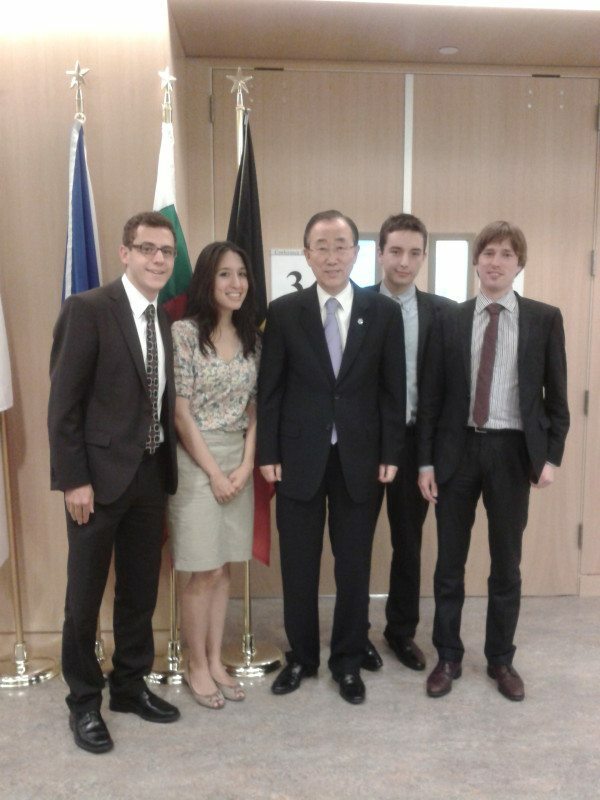 Trainees from the European Union Delegation to the United Nations met with Secretary-General Ban Ki-moon. Picture from Lionel Badal (@LionelBadal). PreviousYour pictures! A few Twitter highlights from the week.